Edge-lit light panel have many uses in retail circumstance such as luxury cosmetic counter display, cabinet display, glasses shelf display, signs, light box for photographic transparencies, stained glass and faux windows. On the other hand, edge-lit panel are used in under cabinet and stone such quartzite and onyx or other man-made translucent countertops. The embedded LEDs installed in the sink of PMMA acrylic emit the bright across the whole acrylic light guide plate (LGP). Therefore, the edge-lit LED light sheet could be fabricated to frameless light sheet. As we know, retail display need highlight products in the retail environment in order to attract the people attention. MAX Illumination edge-lit light panel is capable of emitting high lumen and available in different color temperature Kelvin to meet with retail requirement. For the maintenance, it evenly illuminated and last for 50.000 hours or 5 years guarantee. 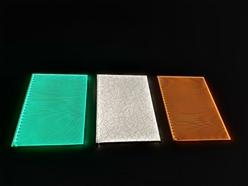 The super slim edge-lit LED light panel is available in 6mm, 8mm and 10mm to fit with restrain areas. We are also able to customize extreme mini size to giant large panels result in meeting with different shelf size requirement. Our unique cutting or laser cutting technique allows us to make extremely large custom panels that are evenly illuminated without any hot spots and cold spots. Our specific heat dissipation design produce limited to Zero heat. Our high CRI backlit and edge-lit LED light panel can enhance your retail and shop environment. For more edge-lit LED Light sheet, you could contact with us.